what form they are in, ie...liquid or solid, and the volume of the sample, different dispersion techniques are employed relative to the required throughput, to provide optimal conditions for image capture. ​​What is unique, compared to other methods, specifically laser diffraction, and sieve analysis, is the ability to detect particle shape, instead of making the practical, but false assumption, that all particles are spherical. When you have the ability to measure, and quantify, particle shape parameters, particle size takes on a whole new meaning. The 500 NANO Analyzer is specifically designed for static, non destructive analysis of low volumes (Down to 1 ml) of very fine powders. The sample is placed in a small cup with a tearable membrane floor. ​A special vacuum pump is then used to tear the membrane, and deposit millions of particles on a glass slide, in just a few seconds. The integrity of the powder is maintained, while agglomerates are gently dissociated, providing good orientation, and natural sedimentation on the glass slide. PROVIDE FOR MORE COMPREHENSIVE ANALYSIS, MORE ACCURATE, THEY STILL NEED TO BE ABLE TO CORRELATE TO SIEVE RESULTS. OF MATERIALS LIKE ABRASIVES, WHERE THE THERE IS REDUCED PERFORMANCE AS THE PARTICLE IS CLOSER TO BEING SPHERICAL. WHERE THE DEVIATION FROM SPHERICITY IS MEASURED, ALONG WITH THE SHAPE OF THE ASPERITIES. LEFT-OCCHIO USES THE CONCEPT OF THE MAXIMUM INSCRIBED VIRTUAL DISC, TO MEASURE THE WIDEST PART OF THE PARTICLE, WHICH WOULD INDICATE WHICH SIEVE APERTURE THE PARTICLE WOULD BE RETAINED BY. LASER DIFFRACTION DOES NOT HAVE THIS CAPABILITY. AFTER YEARS OF RESEARCH IN OPTICS AND LIGHT, OCCHIO DEVELOPED A SPECIAL MONOCHROMATIC BACK LIGHT TO PROVIDE SUPERIOR PARTICLE DEFINITION. COMPARED TO NORMAL WHITE LIGHT,. 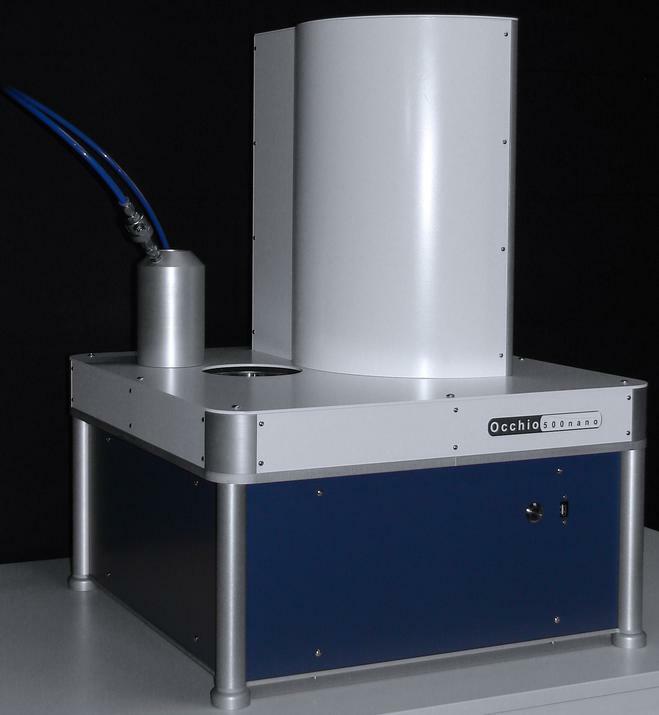 ALLOWING THE DETECTION OF PARTICLES BELOW 1 MICRON. THE BLUE LIGHT SOURCE IS COLLIMATED, AND ACTS LIKE A CALIPER, MEASURING ALL FACETS OF EACH PARTICLE IN HIGH DEFINITION. Each analysis may be defined as an SOP, so that frequent tests can be run by several operators, with no need for programming, and the same results every time. After running an analysis, the comprehensive analytical software package Callsito tm creates detailed reports, in a variety of useful chart formats, including bimodal, boxplot, scatter plot, and 3-D, showing shape and size distribution by number, and or percentage. 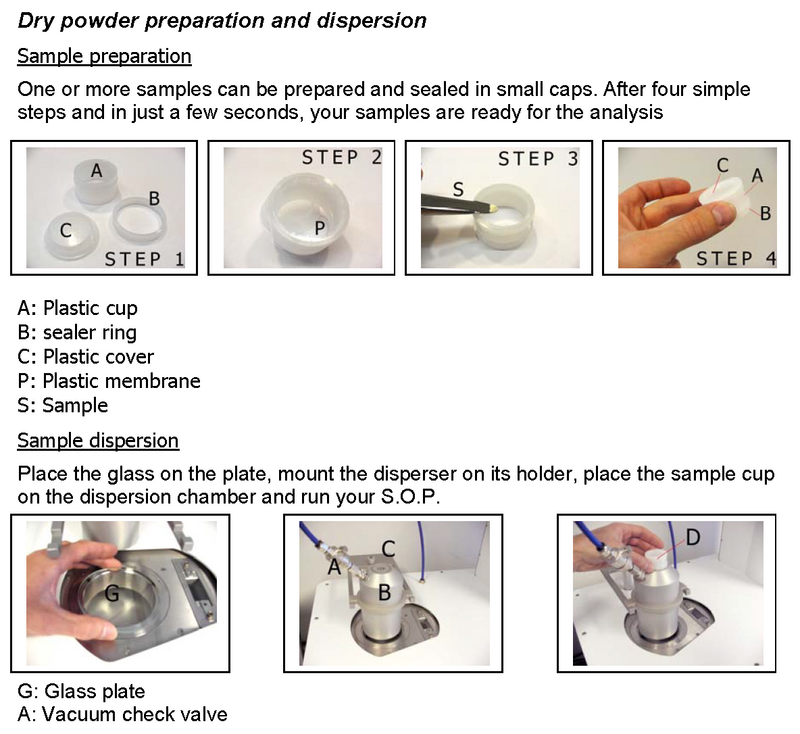 SPECIAL DISPERSION CUP ALLOWS FOR SAMPLES AS SMALL AS 1ml TO BE ANALYZED.